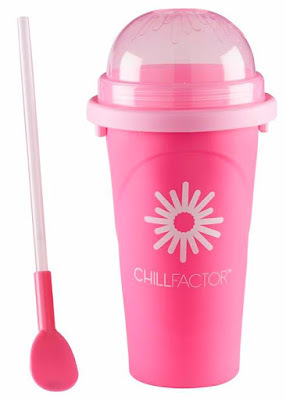 Win a ChillFactor™ Tutti Fruity Slushy Maker in pink worth £12.99 from Character Options! 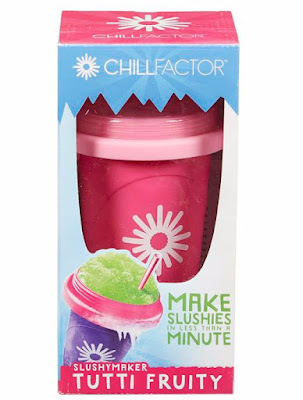 ChillFactor™ products are innovative, original, easy-to-use and fun! Their secret is RFT, or Rapid Freeze Technology. You'll be amazed at how quickly you can turn ordinary ingredients into super chilled, extraordinary slushies and snacks and the best part is no mess and no fuss! In your kitchen everyone can be the ultimate master chef! ChillFactor™ finally means you can make chilled drinks and treats using your favourite ingredients, anytime and anywhere you want! You decide what goes in, and how little or big the serving should be. The ChillFactor™ experience is as easy and simple as freeze, squeeze and enjoy! It wouldn't be right if I didn't let you know some of the awesome achievements and recognitions ChillFactor™ have received seeing as I'm giving one away! • #1 Best Selling item on Amazon.co.uk within first week of release. • #3 Best-Selling Item By Value in the UK. • #4 Ranking Item of All Items in Spain. • Awarded the ''Lifestyle Toy of the Year Award 2013'' in the UK. • Awarded the ''Most Innovative Product Award of 2013'' by Australian National Retailer. Please note: You must follow or like Unique Young Mum and Character Options on at least one social media platform! To find out more about Character and to view their full range of toys, check out the official website here.